Open Informant is a microproject from our Lab, commissioned for Wearable Futures 2013 Conference where it is currently being exhibited as part of the Futures10 exhibition. We were asked to create a wearable concept in response to the theme ‘Absorb’. With just two weeks to develop the concept and create the exhibition piece we had to move fast, and decided to use this opportunity to test the first iteration of a theme we have been investigating in the Lab recently. Since the formation of the nation state, state surveillance of some form has been part of our lives. Today most countries across the world have specialised and well-funded agencies tasked with watching their citizens, from the GCHQ in UK to NATGRID in India and the now famous NSA in the United States. However it is the tools and techniques at the disposal of these agencies that have undergone the most radical change, taking full advantage of the increasingly networked nature of our lives. The NSA, GCHQ and other government security services secretly collect and scan our personal information and correspondence for trigger words; from the overtly malevolent: ‘anthrax’, ‘assassination’ and ‘bomb’ to the seemingly benign: ‘pork’, ‘dock’ and ‘storm’. According to a top secret heat map published by The Guardian and produced by the NSA’s Boundless Informant program, almost three billion data elements from inside the United States were captured by the NSA over a 30-day period ending in March 2013. Over the course of the last few months further revelations have not just exposed excrutiating details of this activity, but also confirmed the “extraordinary disconnect between the scale and seriousness of what has been revealed, and the scale and seriousness of the response”, as John Lancaster reminded us. This increase in the use and scope of technologies of surveillance is often justified with an emotive narrative of safety, and in simplistic statements, exemplified by UK’s Secretary of State William Hague, in response to the recent Snowden revelations: “If you have nothing to hide, you have nothing to fear”. Statements and sentiments like these act to control the narrative around surveillance and close down public debate on the complexities of the issue. In response, our project ‘Open Informant’ attempts to confront the unsettling realties of surveillance in a networked age. 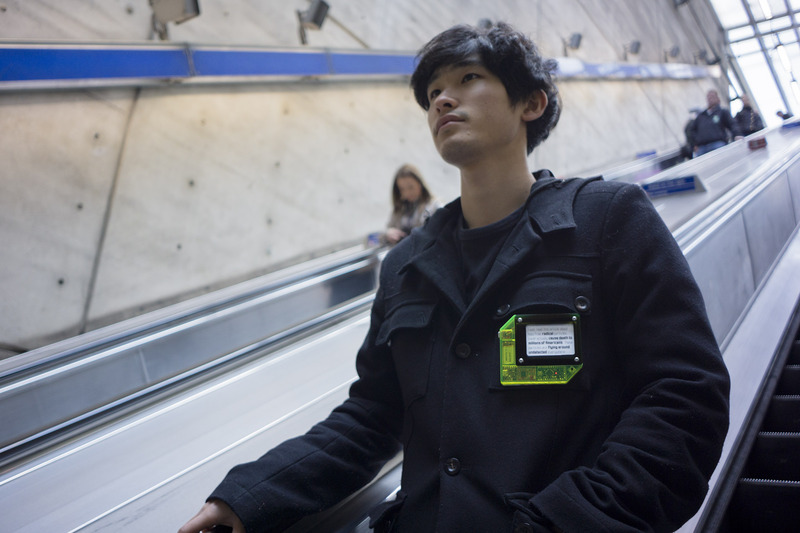 Open Informant is a phone app and e-ink badge. The app searches your communications for these NSA trigger words and then sends text fragments containing these words to the badge for public display. Using the body as an instrument for protest, the badge becomes a means of rendering our own voice visible in an otherwise faceless technological panopticon. By openly displaying what is currently taken by forceful stealth, we question the intrusive forms of mass surveillance adopted by democratic nations on its own citizenry, and in the process, shift the conversation around wearables from being about you and your body as machine, to the culture of machine intelligence and algorithmic monitoring. We would like to thank Cassie Robinson and the Wearable Conference for inviting us to participate in the Futures10 exhibition.